More men are having spinal fusion, but make sure this is the appropriate solution before considering it. The decision to consider back surgery should always come after trying nonsurgical or "conservative" options. However, when the pain is persistent and clearly related to a mechanical problem in the spine, you might talk to your doctor about surgery. There are a variety of procedures for spine-related back problems, but the 800-pound gorilla in the room during any discussion of back surgery is spinal fusion. In this procedure, the surgeon joins two adjacent vertebrae (the large bones of the spine) to form a single unit. Fusing an unstable joint is supposed to prevent motion that can cause pain, but it's a major operation that often fails to offer a lasting solution. As a result, fusion has become the poster child for expensive, risky, and unnecessary back surgery. Despite that, the number of fusions has risen sharply over the years. But men with aging spines should be wary of fusion and its false promises, says Dr. Steven Atlas, an associate professor of medicine at Harvard Medical School. "Based on the evidence, the indications for fusion are few and far between, but that doesn't stop surgeons from doing them or patients from getting them." In spinal fusion, the surgeon joins two adjacent vertebrae (the large bones of the spine) to form a single unit. 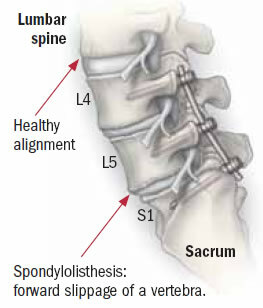 A common indication for fusion is spondylolisthesis, a misalignment of the vertebrae. Fusion may involve metal screws and rods to stabilize the spine. Men end up having fusions for a variety of reasons. In some cases, the spine may show signs of changes that potentially could explain the pain—such as breakdown of the cushioning spinal discs between the vertebrae. But sometimes it's difficult to clearly trace the pain to a specific cause. For such cases of "nonspecific" low back pain, research suggests that the benefit of fusion is hit-or-miss. "You can say half of those who have fusion will have significant pain relief, but flipping a coin is not such a great thing," Dr. Atlas says. When there is pain relief, it is often limited. The pain, measured on a scale of 1 to 10, may decrease from an 8 to a 4. "Your pain is typically decreased by 50 percent," Dr. Atlas says, "but there are very few people who really have no pain after spinal fusion." The relief may last only a few years before the condition worsens again. Another concern about fusion is that joining the vertebrae transfers the motion of the spine to the adjacent joints. This can speed up the wear-and-tear in those other locations. Despite these cautions, many men with nonspecific low back pain still end up choosing fusion. Often, they have already tried physical therapy and other nonsurgical measures, but still end up with disabling pain. The alternative to fusion is an intense, long-term back rehabilitation program to control pain and maintain function. It works as well as fusion, but doesn't involve surgery and the risk of complications. "For people with nonspecific low back pain in their 40s, 50s, or 60s, conservative measures are hard to beat," Dr. Atlas says. "There really isn't a loss of cure, and if new procedures become available you are still able to have them." Unfortunately, high-quality back rehab programs involving a team of specialists can be expensive—and health insurance may not fully cover it. In contrast, surgery is generally paid for if a doctor signs off on it. The prospects for surgery improve if the pain can be traced to a specific spinal disc. However, in this case the right repair is not fusion; it is usually a procedure called discectomy. As spinal discs stiffen and start to break down, the sides may protrude outward, pressing on nearby nerves. The walls sometimes split open (herniate), allowing the softer, gelatinous material inside to squeeze outward. The telltale sign of a disc problem is sciatica—pain that radiates down the buttock, thigh, back of the leg, or calf. For new disc pain, conservative care is the best first step. If sciatica persists or worsens despite conservative care, you might consider discectomy to relieve pain by removing the portion of the disc pressing on nearby nerves. However, studies suggest that a year of conservative therapy is about as effective as discectomy. Therefore, the decision to have discectomy depends on whether you prefer more immediate pain relief. Spinal stenosis is a common problem in the aging spine. Stenosis means the space around the spinal cord has narrowed. Bulging discs and overgrowth of bone and ligaments can all contribute to the narrowing, which presses on the nerves and causes pain. In some cases, fusion can be part of the solution. pain in the groin, buttocks, and upper thigh, but not radiating pain down the back of the legs. If conservative measures such as pain relievers and physical therapy are not controlling the pain and it affects your ability to get around, surgery may be worth considering. The most common procedure for stenosis is called laminectomy, which involves removing the bony plate (lamina) on the back of a vertebra. This opens up more space for the spinal nerves. "It's a simpler procedure that is just as effective but safer than fusion, with 80% to 90% relief of pain," Dr. Atlas says. Fusion should be considered for spinal stenosis only if a vertebra has slipped forward with respect to its neighbor, a condition called spondylolisthesis. "If you can't see that on an x-ray and you have spinal stenosis, you should be having a laminectomy," Dr. Atlas says. "If your doctor is recommending fusion even though you have no spondylolisthesis, get a second opinion." Be especially wary of "complex" fusions that involve more than two vertebra being joined with hardware. These increase the risks of the procedure. Dr. Atlas says that in older people who have a complex fusion instead of a simple laminectomy, the risk of death rises from around two or three deaths for every 1,000 procedures to 10 to 20 deaths per 1,000. That's a significant jump. Like any surgical procedure, spinal fusion comes with risks as well as potential benefits. Instead of rolling the dice with "last resort" surgery, make sure you know what's causing the pain and whether fusion is a reasonable option. What is conservative care for back pain? Wait. The most time-tested cure for back pain is time itself. Many times, back pain gets better on its own. But don't wait to see a doctor if you have "red flag" symptoms with back pain, such as fever or loss of bowel or bladder control. Apply ice and heat. In the early or "acute" stage of a bout with back pain, ice can numb the pain and ease swelling (inflammation) of the injured tissues. After a few days, heat may provide more comfort, get the blood flowing in the injured area, and reduce stiffness. Take pain relievers as needed. Over-the-counter pain relievers ease discomfort and some also reduce inflammation. Acetaminophen (Tylenol) is gentle on the stomach but does not reduce inflammation. The other option is an anti-inflammatory pain reliever like ibuprofen (Advil, Motrin), naproxen (Aleve), or aspirin. Stay physically active. Short periods of bed rest or sitting may be helpful during the acute phase, but extended bed rest isn't. Keep moving as much as you can manage. The movement will help to keep you functioning. Stretch and strengthen gently. As the intense pain subsides, introduce gentle stretching and strengthening exercises. Ask your doctor or a physical therapist for detailed guidance.